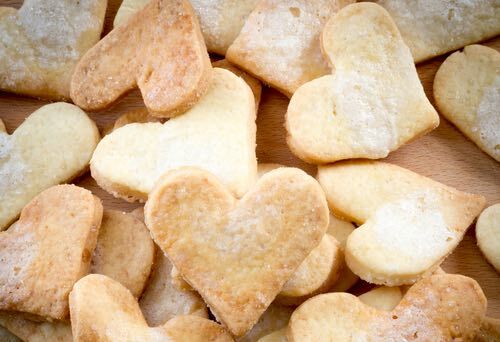 Grandma's homemade sugar cookie recipes are quick and easy to make, and you can always be sure that the results will be delicious. 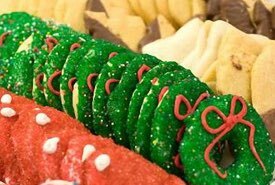 Everyone loves to eat these old fashioned cookies. They're the perfect cookie to serve on any occasion. For special occasions, you can decorate them so easily. Simply cut them in fancy shapes and decorate with traditional colored sugars or top them with a candied cherry. Whenever you're pressed for time, these cookies can be mixed, rolled out and baked within a few minutes. And, they always taste delicious. Make a big plateful now. They're the perfect comfort food after a long day. 2 cups sugar, 1 cup butter, 3 eggs, 1/2 cup milk, 1 teaspoon soda, 2 teaspoons cream of tartar, pinch of salt, flour to roll. Cream butter and sugar, add eggs, then milk. Add enough flour to roll out, sifting soda, cream of tartar, and salt into the flour. Good! 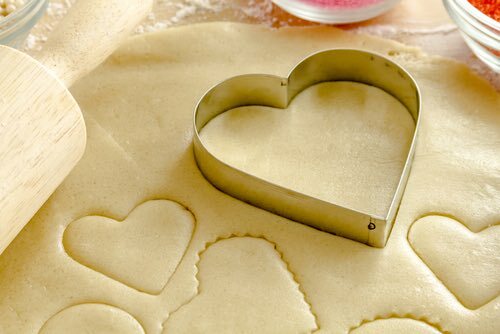 1 cup sugar, 1 cup maple sugar (crushed), 1 cup butter, 2 eggs (well beaten), 2 tablespoons water, 2 teaspoons baking powder, flour to make soft dough. Mix shortening and sugar together. Add eggs and vanilla flavoring. Mix well, then add sour cream and blend well. Then add the remaining ingredients, making sure to mix very well. Refrigerate overnight. Roll out cookie dough on floured board and cut out. Bake at 350°F for 7 to 10 minutes. I frost them with cake frosting, but you can eat them plain or put what ever you like on top. This recipe I had given to me when I was a child, and I never have any left whenever I make them. Sugar, 2/3 cup; butter, 2/3 cup; 1 egg; cream of tartar, 2 teaspoonfuls; soda 1 teaspoonful; hot water, 1/2 cup, to dissolve the soda; flour, sufficient. 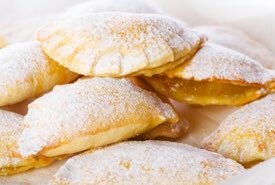 Dissolve the soda in the water and put into the creamed sugar and butter; use only enough flour to make as soft a dough as you can roll, dusting freely. Sugar, 1 cup; butter, 1 cup; sour milk, 1 cup; soda, 1 teaspoonful. Mix soft as possible. "Caraway seed," she says, "is the best seasoning for sugar cookies." 2 eggs; 2 heaping cups sugar; 1-1/2 cups buttermilk; 1 cup either butter or lard; 1 teaspoon salt; 1 heaping teaspoon soda; little nutmeg or vanilla; just enough flour to roll out easily. —Mrs. W. F. Cobbett, Sheridan, Penn. 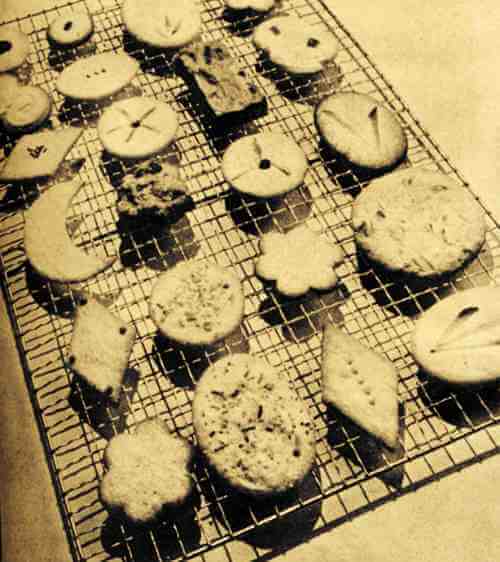 These easy-to-make, old fashioned cookies were once enjoyed at the White House in Washington, so you'll want to serve them at your house! One cup of butter, one and a half cups of sugar, one-half cup of sour milk, one level teaspoonful of soda, a teaspoonful of grated nutmeg. Flour enough to roll; make quite soft. Put a tablespoonful of fine sugar on a plate and dip the tops of each as you cut them out. Place on buttered tins and bake in a quick oven a light brown. A small teaspoonful of Pearl ash [cream of tartar], dissolved in warm water. Four tablespoonfuls of Caraway Seeds. Cut the butter into the flour. Add the sugar and caraway seeds. Pour in the brandy, and then the milk. Lastly, put in the pearl ash [cream of tartar]. Stir it well with a knife, and mix it thoroughly, till it becomes a lump of dough. Cut the dough in half, and roll it out into sheets, about half an inch thick. Beat the sheets of dough very hard, on both sides, with the rolling pin. Cut them out into round cakes with the edge of a tumbler. Butter iron pans, and lay the cakes in them. Bake them to a very pale brown. If done too much, they will lose their taste. Let the oven be hotter at top than at bottom. These biscuits, kept in a stone jar, closely covered from the air, will continue perfectly good for several months. Mom and I used to make these Chocolate Sugar Cookies. In a double boiler, melt chocolate and butter together. Stir in egg and vanilla. Gradually stir in sugar until well blended. Transfer chocolate mixture to a medium bowl. Gradually mix in flour and baking powder until mixture is smooth. Cover and place in the refrigerator for 2 hours. On floured surface, roll dough to 1-1/2 inches thick. Cut out shapes with cookie cutters and place on non-greased baking pan leaving at least 1 inch between cookies. Bake for 10 minutes at 350° F. Let cool for 30 minutes on a wire rack before decorating. Decorate cookies with homemade frosting and color sprinkles. One and two-thirds cups sugar, one cup butter, three eggs, two-thirds teaspoonful soda, one small nutmeg, flour to roll. Roll thin and bake in a quick oven. Woman Suffrage or "woman's right to vote" refers to the difficult battles fought by the Women's Suffrage movements to gain democratic voting rights and the right to run for public office. The Grand Duchy of Finland was the first country in Europe to introduce Women's suffrage in 1907, whereas in Canada most provinces granted women suffrage between 1917 and 1919, though women in Prince Edward Island waited until 1922, and women in Quebec waited until 1940. 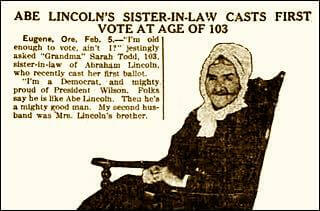 Women in the United States were granted their suffrage in 1920. It makes one think, as the right to vote is so taken for granted in today's societies. Exercise your right to vote!